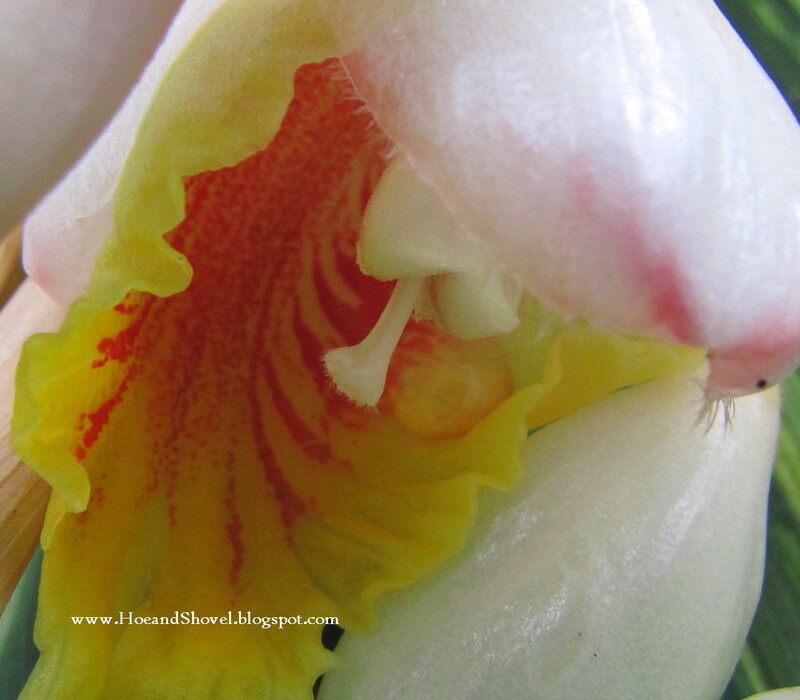 Like clockwork it is the glorious month of May when we look for these drippy blooms to appear. 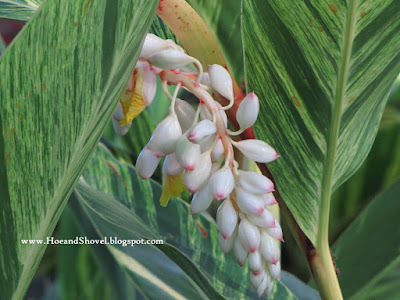 When the Alpinia zerumbet, Variegated Shell Ginger was initially planted ~~ eons ago (read:ten years) ~~ the luscious blooms were not even a factor in their consideration. Little did this gardener know they would indeed bloom. At that time the decision was made to situate them as a mid-level layer curving around the length of the front border that hugs a large stand of oak trees. Gingers were selected based on the need for a perennial in that area to take the place of my then habit of switching out annuals every season. 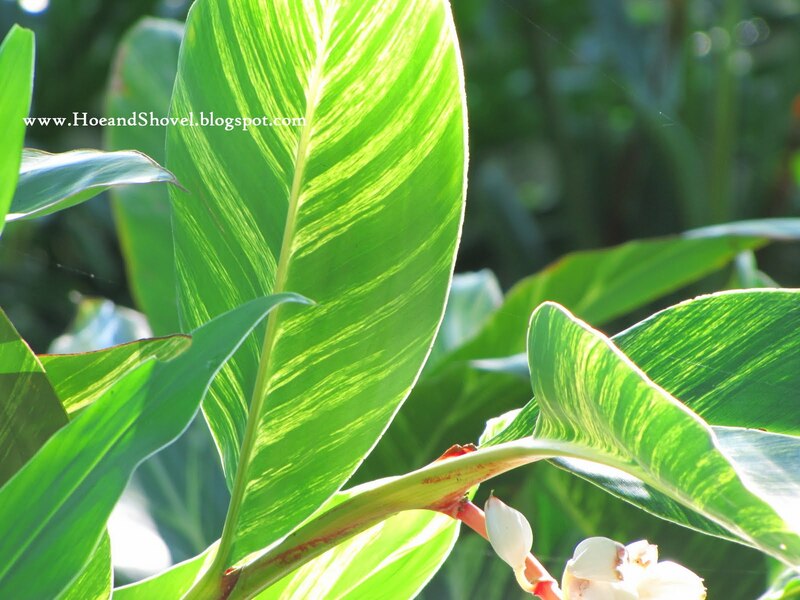 This lovely specimen met the criterion for my LOVE of foliage with their outstandingly large leaves ~ each one reaching out 18" - 2' from its stalk and 6-8" wide~~ coupled with their eye-catching, stripey foliage. Consideration for height capabilities and Florida-Friendly low-water needs along with their ability to thrive in shifting shade were characteristics that also grabbed my attention. When those elongated pendants pop open a waterfall of bulbous pods cascades from the mother leaf. 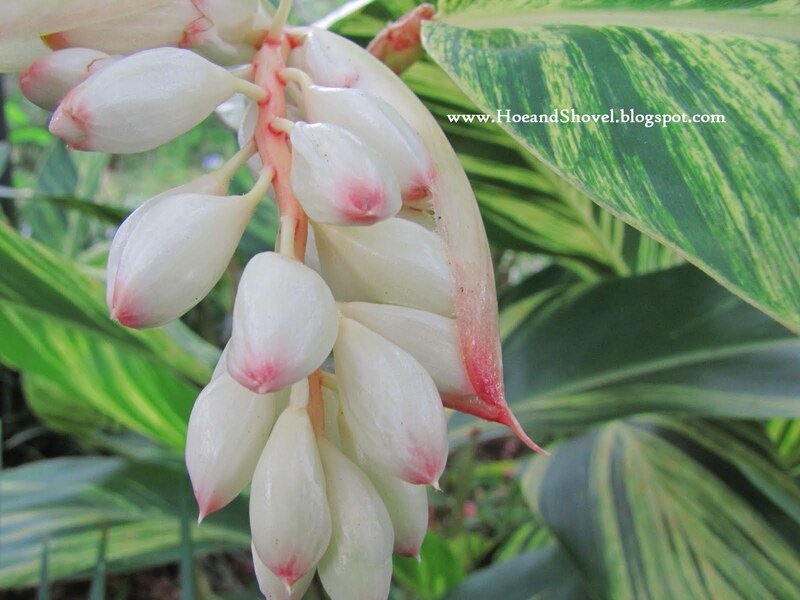 Opulent, creamy white pods with pinky tips echo the color variations from the buds' covering they are borne on as well as the stems of each new stalk on these wonderfully tropical plants. Planted in large groupings in the front border and clusters of them repeated in the back gardens adds continuity and impact while brightening the understory of oak trees. 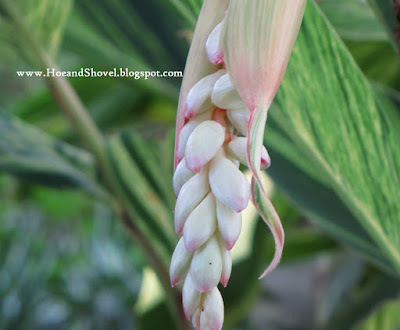 Many additional ginger plants have been gained by digging up an entire plant and dividing the rhizome for transplants. If the drippy pods were the final result of these blooms this gardener would be completely giddy. Instead, as if insistent to exceed the previous glory in the blooming process, as time passes, each one of those puffy, bulbous pods individually bursts open to reveal yet another phase. Hidden inside, waiting its turn to appear, is an exotic ruffly bloom colored in yellows and oranges resembling a seashell. Can you tell the variegated ginger is one of the all-time favorites in my Florida -Friendly garden! It ranks as one of my must-have perennials. The drippy, exotic blooms are just a bonus adding to the dramatic effect these plants add to the landscape. That is divine! What a show from foliage, through buds to full bloom. When I have enough shade, I may give that one a try. Gingers do okay here with lots of moisture and rich soil. How beautiful, Meems. Thank you! 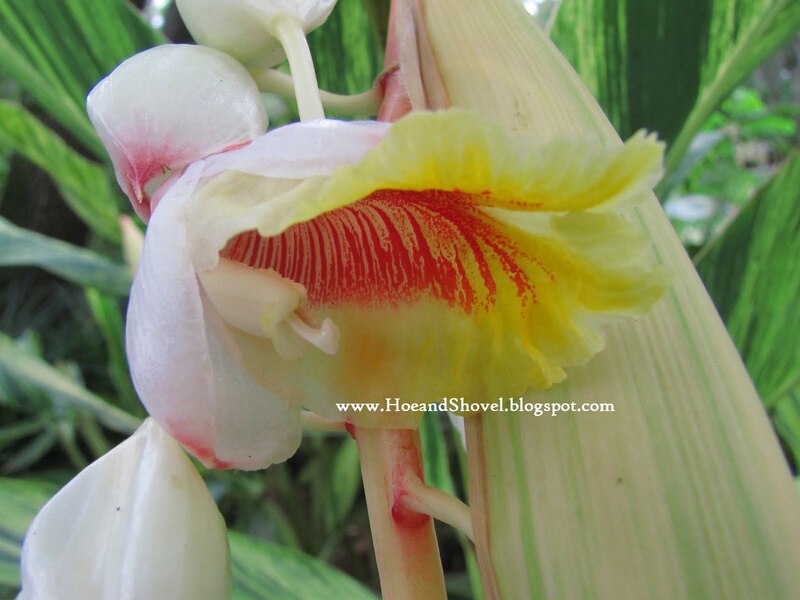 I always feel like I am on vacation when you start showing those exotic plants in your garden blooming. They are just beautiful. Meems ~What a tropical beauty! I don't believe I've ever seen them in person before. I would love it too. Do the blooms have a scent? Enjoy and thanks for sharing the progressing of pictures. Varigated Alpinina is one of my favs for foliage. It gets killed back to the ground in winter here. I'm afraid mine will never bloom. I tried potting up some and replanting. It just doesn't 'take off' in time. Yours is lovely. I'm glad to get to see the blossoms up close and in different stages. Meems, your shell ginger is so beautiful! I'm starting to doubt my decision to choose other, "rare" varieties at the recent sale I attended, since yours are so lovely. Enjoy! 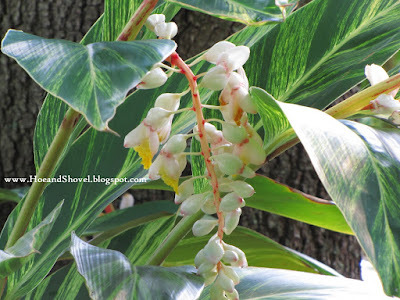 I just love shell ginger blooms. I have the one with the all green leaves-dug up a piece a few years ago from a friend's yard-the leaves smell like ginger cookies! I love the very tropical look of this plant. Don't you love it when a plant has the complete package: wonderful leaves, pretty buds, and great flowers? The striations on the foliage really stand out. Wow, your shell ginger is blooming? Mine is still coming back from the ground. I only had blooms one year after a mild winter. Funny how we can have such different micro-climates. I do think these blooms are stunning! Still waiting for mine to bud. I think the cold knocked them back a bit, since in a normal year, they would have bloomed by now as well. Lucky you! Very stunning flowers! My friend dug some of these out in her garden and gave to me. I planted them in a partial shade area, they are still young, and growing the leaves. I might need to wait for years before I can it blooms. But, the foliage itself is pretty enough to stand ther as backdrop! Meems, our shell gingers at my model home are blooming profusely now too! I'm shocked because the foliage looks so bad after the freeze but I refused to trim it since I read they will only bloom on old growth. Question for you; I ordered some calladium bulbs after becoming obsessed with your blog and planted them about 3 weeks ago (We're in zone 10). When can I expect to see some growth, and will the fragile leaves be able to push through the heavy compost layer? Thanks for your advice. While we're on the subject of shell ginger, how do you prune yours, if at all? Hi Meems.....now I wish I had not visited, I have bloggers envy. What a gorgeous plant, and I cannot even think of having it here unless in a greenhouse. These are absolutely beautiful. I have just added them to my must have list for perennials. That is twice in the last 3 days you have inspired me to try a new idea in my garden. Thank you so much for sharing your gorgeous "babies" with us. Meems~~ A must-have for me too. I wish! This Ginger is one of those "What's-not-to-love" gems, isn't it? Always a pleasure to visit your gardens. Your love of plants and your design prowess are sooo enviable. Can't wait until my ginger matures enough to bloom! Thank you all for your generous comments. If you are in the position to grown these wondrous plants I know you will love them for many years. 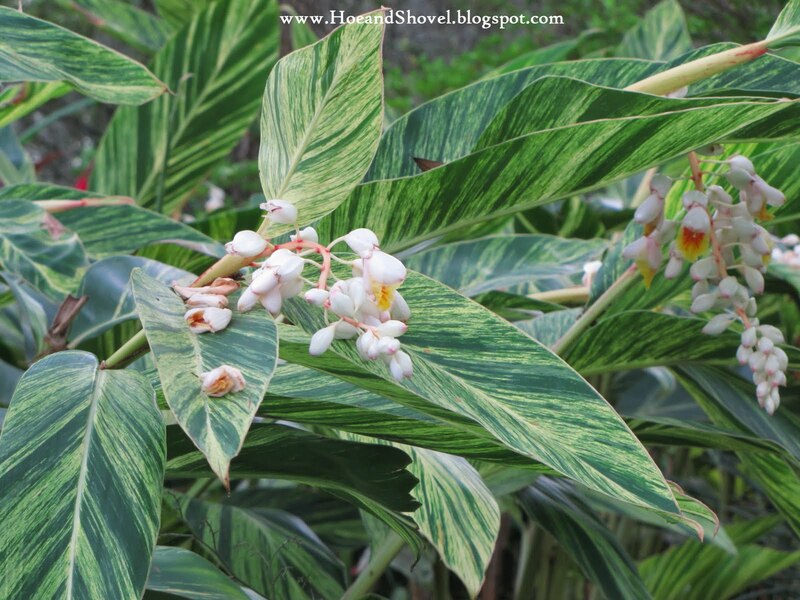 These variegated variety do not grow as tall as the non-variegated variety but can still get to 6 feet. They are sturdy enough all on their own not to require any staking. I do prune mine back 2-3 times a year in an effort to keep them at around 4-5 feet (in the front garden). Over time some of the (entire) stalks will periodically die back. I have found that cutting them out completely (to the ground) promotes new growth from the ground with new stalks that keep the individual plants thriving year after year. This year with the brutal winter some of them (depending on location) received some frost damage which caused browning around the edges of many leaves. I cut those off and pruned every plant back in late March. This made me wonder if they would bloom at all this year. But then I remembered I always prune them back in spring and they bloom each year in May. They prefer a well-draining but heavily composted or organic soil. This year I did give them a spring dose of 10.10.10 mixed with bone meal hoping to encourage them a bit after the awful winter. Flower Lady, The stems and leaves of this plant are wonderfully fragrant. I cut off the leaves and some of the younger stems to use in fresh flower arrangements. The flowers are lightly scented but nothing like the plant the itself. I hope I've answered your pruning questions. Wherever I prune it is just above an existing leaf node. The growth returns very fast after a pruning. In my experience pruning promotes fuller plants and if they are going to bloom they will bloom even after being pruned. My suggestion is that you trim yours where they are damaged.I think "older growth" only means mature plants that have been in the ground for a few years. 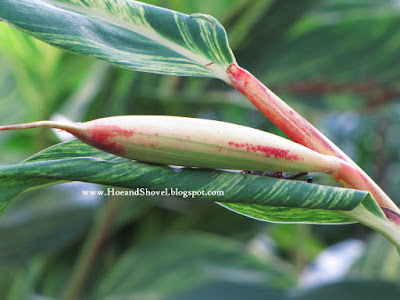 As far as the caladiums... your bulbs should start coming out of the ground very soon with the soil warming so rapidly. You probably already know this but your mulching layer should not ever be more than 3 inches at the most 4. Caladiums will find their way out of the mulch as long as you compensated for the additional distance when you planted them. All the "official" information on caladiums states to plant them approx. 2-4 inches under ground. Because of my mulching habits I never go quite that deep. Hope that helps. Where do you purchase your Shell Ginger? I bought mine from a little old man in my area who is no longer in business. :-( He owned a fresh produce market and would pick up plants for me when I told him what I wanted. But I know they carry them at Home Depot and Lowe's in my area. What part of the state do you live in? Fascinating. I never knew they did that. It would be something to watch. After reading your post, I want one in my garden. I can see why is your favorite. I live in St. Petersburg. 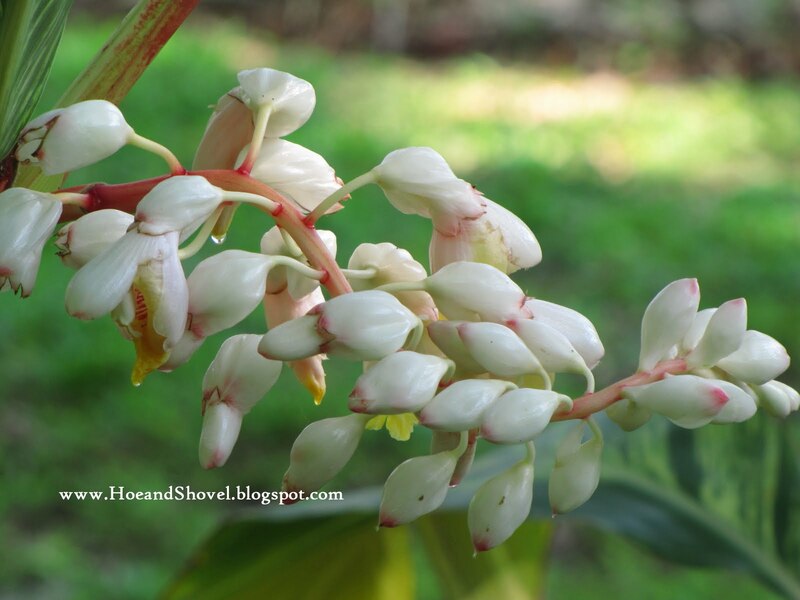 I was told by one nursery they no longer have a source for Shell Ginger...another nursery said they rarely bloom here. I would buy them just for the foliage, but those blossoms are to die for. I did find a landscaper who may be able to get some for me. Where are you? Also, I did go to the caladium store you mentioned in one of your posts and bought about 80 bulbs; but, now, I am afraid it is too late to plant them. Can they keep until next spring in a dark closet...or it is ok to go ahead and plant? Be sure to give it some shade in your 'hot' Miami. We are just over the bridge from you in North Hills. Cty. I planted caladiums last year as late as late July. They popped out of the ground very fast (the soil is very warm by then) and they lasted right into winter. I haven't planted my new ones yet this year. I'll get around to that in the next week or so. All that to say I'm pretty sure it's okay if you go ahead and plant yours. OK; I will give it a shot. I 70 bulbs with a mixture of those you posted on your blog...I have never used caladiums as an underplanting; but, I think yours look lovely. Those I do have come back every year if I do not get in there during the winter and aerate the soil too much. I have never been too concerned about the soil pH with them as my soil is heavily composted anyway; but, I would like to underplant my a azaleas with them and the soil is acidic. Will they handle that? I was born and raised in Tampa, and I am not familiar with North Hills Cty. Usually a plant with pretty foliage has a somewhat bland flower, but this ginger has both great foliage and a beautiful bloom. It's a winner in the garden! I haven't ever underplanted my azaleas with caladiums. I don't know off-hand of any reason why it wouldn't work. They both like the same conditions pretty much. Mr. Meems and I were both born and raised in Tampa. Small world. We now live in North Hillsborough County just north of Tampa. You are so right. I'm not sure I could live without my shell gingers...or I should my garden couldn't live without them. And so many gingers disappear in the coldest months to return in spring. I'm glad these stay around all year.